Great news! The genome importer feature is available in the doc.ai app and now you can learn more about your genome! If you already have a genetic test from 23&Me or AncestryDNA, import it into the doc.ai app and start collecting your health data. We are building new features of your genome from ancestry insights to include pathology, carrier status, and pharmacogenomics. The doc.ai infrastructure enables the collection of other omics data besides the genome to include exposome, which analyzes air quality; physiome – your physical activity; microbiome – analyzing bacteria in your body; and pharmacome – drugs and supplements you take that affect your microflora and influence your overall health, among others. See the full list of omics that you can securely collect with doc.ai. We’ve built a bioinformatics team led by Kartik Thakore, which has been recently reinforced by Wim Van Criekinge, a Professor in Computational Genomics and Bioinformatics at Ghent University who has brought his 25+ years of expertise in genetics as scientific advisor at doc.ai with products like Wobblebase and GeneWall that help interpret the genome and conduct genomic browsing, and we are leveraging our efforts in genetic sequencing. There is a great deal of information available from tracking devices to different lab tests to genome tests, but this is disconnected data that can’t be turned into action today. The doc.ai platform enables you to collect your health data in one place and over time build a full picture of your health, connecting data points, to find patterns and reveal insights about your health conditions. Your genes are just part of the story. The environment in which you live and overall lifestyle habits are also important. The latest publication “Nature vs. Nurture” from doc.ai advisors Chirag Patel and Arjun Manrai from Harvard Medical School recently published in Nature reveals new research showing how a mixed pool of factors, such as genetics, living environment and more shape a person’s health. For example, combining your genomic information with exposome (environmental exposures) can provide unique insights into your risk of developing asthma as well as other chronic diseases. At doc.ai your data is yours and yours alone. It means only you decide how you want your data to be used and if you are willing to have your data safely shared anonymously with verified researchers to help accelerate medical research. On top of being HIPAA compliant, our team has leveraged blockchain technology such as smart contracts and machine learning to enable our core value since the first day that the company was established: you are in full control of your data, and you’ll know exactly when, why and how it’s used. 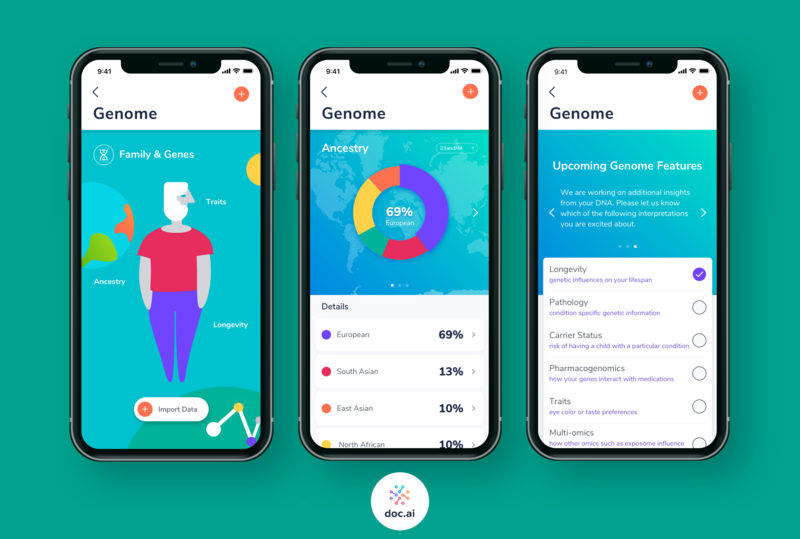 Download the latest version 1.0.8 of the doc.ai app and try out the genome importer feature now to start building a full picture of your health!